To provide us with feedback / comments from your stay – please go to our Feedback page. Judy Hunter Lovely peaceful rural outlook at this farm stay. The hosts were very caring and concerned for my walk. I enjoyed their company and the beautiful breakfasts as well as learning about their farming life. It felt as if I was a part of their family life for the two days i was there. Many thanks to all the Rogers family for your warm welcome. Craig Thank you Jackie & Phil. The warmest welcome, most comfortable bed and most powerful shower. Thanks for looking after me! Tim Stubbings We had a lovely short break at Worsell Farm, staying in Higher Shippen cottage as a family of four. This is one of the nicest / best self-catering farm cottages we’ve stayed in and Jackie provides a welcoming, clean and extremely well equipped place to stay. The nearest cove and coastal walks are only 10 minutes away across one of the fields, with enough to explore without having to use a car every day. David Flatley Fantastic stay !! – 5 fantastic nights and days at Workweek Barton !! – Thank you so much , Phil and Jackie , for a wonderful stay !! Philip Matthews What can we say – Excellent accommodation, excellent food and wonderful company all set in the best part of world. We had a one night stay at Worswell Barton b&b and was warmly received by Jackie. Our ensuite room was very clean, bed comfortable and everything we needed was to hand. The views are magnificent. Phil and Jackie took us to the village in their car as no taxis run to the farm, during our return journey it was interesting to learn a little about the history of the farm and about the livestock from Phil. Breakfast service attentive, the food tasted great and was plentiful. Hi Jackie. Just a short note to say how much we enjoyed our 2nd stay with you. It felt like coming home. Sorry you had shot off to town so we did not have time to say a proper goodbye. God willing we will be back. Rosie Bowen Thank you so much, not only for a faultlessly comfortable stay, but especially for the warm welcome and the extra care to make sure we had all we needed ( including sunhats and a lift home from the pub! )Very best wishes to you both. Paul Dorey Far and away the best experience I’ve had in a Bed and Breakfast. Thanks so much for such warm hospitality! Wayne & Pauline Thom Superb accommodation, spotlessly clean, comfortable, great location. Shirley Charity Our stay at the B&B was great. Very relaxing. The breakfasts were brilliant, anything you wanted was possible. The room was lovely . The Rogers family are doing a great job. Really nice people. We will recommend it to our friends. Peter Ward Could not offer a higher recommendation!! Given the most warm welcome – beautifully appointed home within a working farm. Lovely people !! excellent bedroom and facilities. Excellent and varied breakfast menu. Recommendation given for eating at the “Ship Inn” was spot on – very good food at realistic prices , helped by offer of transport to and from!! Will suit walkers and is a boon to people like myself who come from a country and farming background. Any person who did not enjoy a peaceful, relaxed yet attentive stay here would be very hard to please!! Will most definitely look froward to a return at some point. Harry Thanks for the hospitality and the lovely place. we enjoyed a lot. will definitely look to come and stay again. Gary Main A great B&B indeed! Terrific infact!! Both Jackie & Phil were perfect hosts. Nothing was to much trouble and we were even offered a tour around the farm which we found utterly fascinating. Lovely welcome, delicious food & wonderful views. Phil even found the time to introduce us to his new very hi tech Combine Harvester. Now you don’t get to play with one of those every day eh? Superb bit of kit!!! Without any shadow of a doubt we will definitely be back. Well done the two of you. MiriamFagan Thank you for a lovely stay, the room was lovely, we particularly enjoyed drinking tea from china cups and poured from a teapot with delicious biscuits. The location of your farm is so special and Noss Mayo is spectacular. We hope to come again! Dear Jackie We had a lovely time staying with you last night. Thank you for the welcome and the lovely breakfast. Hi Jackie Thank you for looking after us so well. You really did go the extra mile literally. Extra few miles with ferrying us around. Everything was perfect. Thank you. Jeremy B Stayed here whilst walking the coast path. Without doubt it is one of the best B&Bs I have ever stayed in. Really comfortable and a fantastic welcome from our hosts. Phil and Jackie are great people and even picked us from the Ship Inn when the evening was over… Really great. A truly fantastic breakfast too. Not too expensive and a real gem – very close to the coast path. Bob Burns Dear Jackie and Phil, Good to meet you both at the weekend and thanks for your hospitality. ( I hope that Greg has recovered!!) Great to see another ‘industrious’ family business…..just getting on with it! Hopefully we will find the time to spend more time at Worewell Barton in the future. If you are ever in Somerset, give us a call. Kind regards, Bob. The Riley Family A relaxing stay in one of the best holiday cottages we have ever visited. Clean, comfortable and homely. We enjoyed the fresh produce and home-made goodies! Plenty of local walks along the beautiful coastal path. We would thoroughly recommend a stay here. Helen Hughesdon Excellent accommodation and fabulous breakfast with bacon, sauages and eggs from the farm. Freshly caught mackerel was also available. Delightful hosts. Easy access to the SW Coast path. Only sorry we only stayed the one night. John Horton I had a lovely room with a lovely view towards Dartmoor. Jackie and Phil, despite being busy with the farm made me so welcome and looked after me so well. As I was walking the SW Coast Path Worswell Barton is beautifully located for a stay but it is in lovely and largely unknown part of South Devon. Phil took me down to the Ship and collected me after my meal ~ very kind. A gem of a B&B in a gem of an area. Alison Lawrance During our week of walking, this was our most interesting and enjoyable night. Our hosts were full of information and willingly told us all about the farm, its history and how it is now working – we left with a considerably better understanding of it all than when we arrived. The room was lovely, the breakfast delicious, the transportation unexpected – we only regret that we could not have stayed longer. Nic Swartz We thoroughly enjoyed our stay. The farm is very relaxing and the walks are beautiful. Breakfast was amazing and we were made to feel right at home. I would not hesitate to recommend you to friends when they visit the area. John Rob Saunders My wife and I thoroughly enjoyed our stay in this beautiful farm house. The standard of accommodation was excellent, the situation of the farm idyllic and the views wonderful. The breakfast was better than that provided by many hotels. It was also nice to have produce from the farm (sausages and bacon)together with a variety of fresh fruit. I can recommend this B&B without reservation Also Mr & Mrs Rogers were extremely friendly and it was almost like staying with friends. K&J BROWN Gunrow was a lovely room in a beautiful house, our bed was so comfy, shower in Gunrow was amazing, what more can be said about the breakfast, all praise is justified. Thankyou for looking after us Jackie, we’d love to come back one day…. paul hatton beautiful & quiet location. friendly & helpful owners. comfortable beds. great breakfast. would recommend to anyone. Mervyn Sellick & Pau Well, what can we say. Probably the friendliest B & B we have EVER stayed at – and that is numerous. Jackie & Phil are brilliant hosts and totally make you ‘one of the family’. If that was not enough the accommodation is superb in a fantastic farmhouse in what could be argued as the best and most stunning part of Devon. And we could tell you about Jackie’s breakfasts – but we shall leave that for you. If you are reading this and thinking of booking, don’t think, just do it. You will not be disappointed. The ONLY disappointment was that we only stayed there for 3 nights – we wanted to move in permanently………..
Baz Miller I had the pleasure to stay at the Farm Sunday just gone. On arrival I was made to feel most welcome and the friendliness continued throughout my stay. After a guided tour of the guest areas I was shown to my room. Delightful, fantastic views, very comfortable bed and spotlessly clean bathroom/bedroom. Breakfast was a treat, many homemade or grown tasty temptations to accompany the traditional full cooked option I had. VERY Nice. I look forward to visiting again sometime soon. Thank you all very much. ann garmeson We really enjoyed our overnight stay here and were made to feel very welcome even though it was a late arrival and we were quite dusty! We were even picked up from the local pub! The house has a lovely ambience and we both slept very well. Breakfast was excellent, the best we have had so far and we have walked the coast from Poole. We will definitely start our next leg here next summer. Berit, Lise og Gro We truly enjoyed our stay at your picturesque farm at the end of the hedge-lined road-maze with crops and vegetables, cattle, dogs and a few guests, beautiful cliffs, horizontal rainstorms and a breakfast to die for! Thank you again so much for your hospitality and extra commuting-service to/from the pub 🙂 Definitely a destination we will recommend to friends! Karen Quite possibly the friendliest B&B I’ve ever stayed in. Jackie and Phil made me feel so at home and went out of their way to make sure I enjoyed my stay. The room was perfect, with all the creature comforts you’d expect in a hotel. The surroundings are beautiful and the coastal walk into town is stunning. A really authentic English farmstay experience. And the breakfast is to die for! Ann, Chris and Simon A charming farm full of character and history. We both had superbly comfortable rooms with amazing views. It was an extremely enjoyable visit and we were heartily welcomed by Jackie and Phil throughout our stay. We will definitely book here again! J David Armstrong This is the most wonderful B&B I have ever stayed in. Jackie and Phil are great hosts, intent on making everyone’s stay 100% enjoyable. And I would count them as friends. The location, accommodation, amenities and food are everything you could ask for. Max Graesser We enjoyed a delightful week surrounded by glorious countryside. Fantastic coastal walks or an easy 25 minutes down to the village and pubs (less easy coming back) Jackie and Phil made us all feel very welcome. We hope to return either as guests or (hopefully) residents in nearby Newton Ferrers. 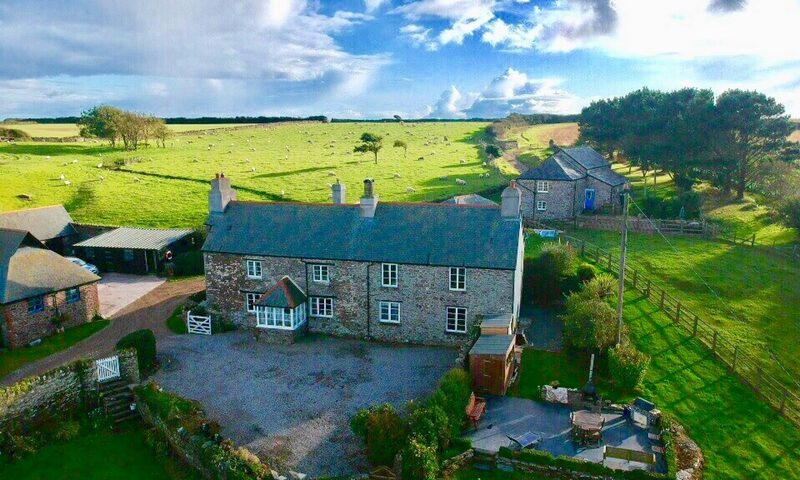 Paul Dunkley This is a delightful place to stay in the South Hams very much off the beaten track yet ideal for the South West Coastal Path and some fabulous walks. Jackie and Phil keep things very shipshape and are delightful and helpful hosts. The breakfast was superb with fresh and home made produce everyday. The farm supplies fresh eggs and vegetables as well to take home or to compliment self catering. Noss Mayo is not far away where there is a choice of two pubs both doing good ale and food in a fabulous unspoilt setting. If you are looking for a quiet escape from shops, phones, traffic and the crowds you can do no better. The coastline nearby is stunning. Jerry & Karen From the moment we arrived (never forget that first impression Phil!) we were made to feel completely relaxed and at home. Our room (Gunrow) & en-suite was beautifully clean and comfortable, with stunning views to wake up to. All the finishing touches were there and Jackie and Phil were so eager to make our too-short-a-stay just perfect. Really tasty cooked brekkie (those eggs and mushrooms!). Such a peaceful location to rest a while. Thanks so much to you both.